The well-insulated creation that appears on the cover of Nests was found about as far north as a little perching bird can survive. It was built by a Hoary Redpoll, a small but hardy bird that breeds in the Arctic’s nearly barren islands, stunted forests, and tundra in Alaska, Canada, and Eurasia, from sea level to above timberline. Able to weather temperatures as low minus 67 Celsius (-89º F), many spend the winter in their breeding grounds, living off plants not buried under snow. Survival in this extreme cold is made possible by downy feathers that double in weight in winter, a high metabolism, and an expandable food-storing pouch in their esophagus, which enables them to regurgitate and husk seeds under shelter, and to store enough to fuel them through the night. Some populations do wander southward to warmer temperatures and better food sources, moving diurnally in small feeding flocks. 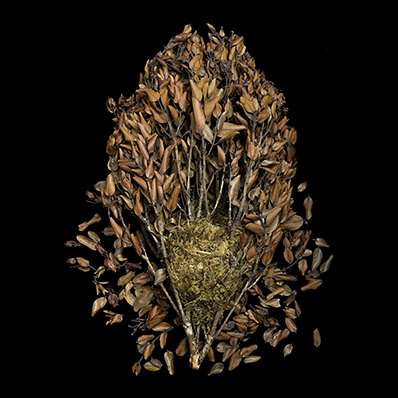 These agile acrobats are often seen hanging upside down to reach the seed heads of grasses, weeds, and shrubs; birch, alder, and willows catkins, as well as tender leaves and buds. During nesting season they add the protein of insects, and feed them to their young. In alternating years they may descend on food sources in large flocking irruptions when seeds, especially birch seeds, dwindle in their usual feeding grounds. Therr sociability continues while breeding, nesting in loosely spaced groups, low in shrubs or trees, on the ground, or occasionally in cavities in trees or terrain. In a race with temperature, they are a quick-breeding bird, reusing nests or constructing new ones in as little as two days. 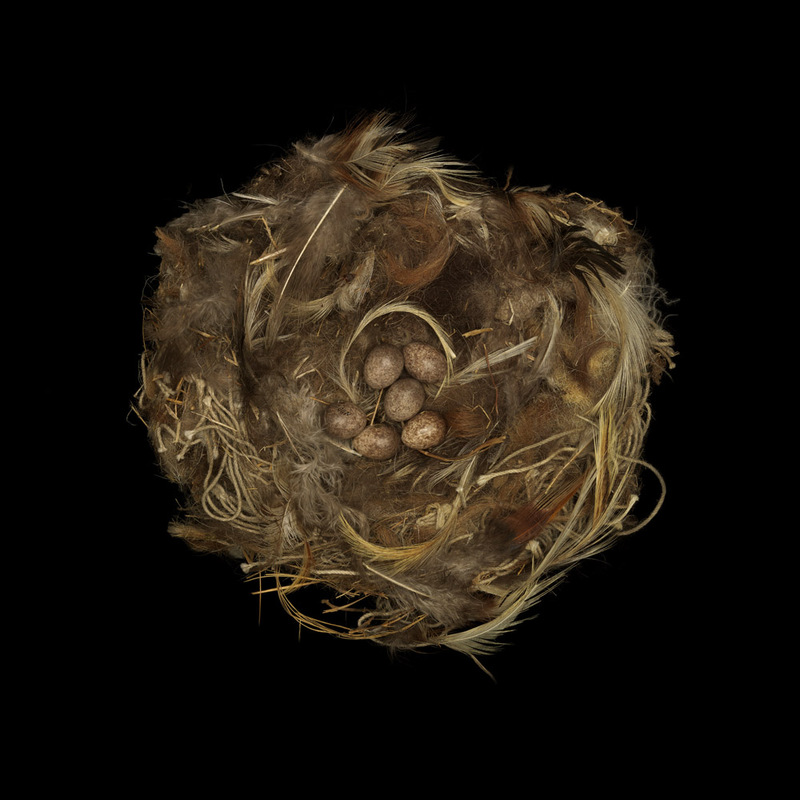 The female is the builder, using twigs or grassy plant materials to form the framework of the cup, then lining it with the insulating softness of fine grass, willow cotton, caribou hair, vole fur, or ptarmigan feathers. Males feed the incubating females (sightings of one being fed by more than one male raise the question of their mating system). 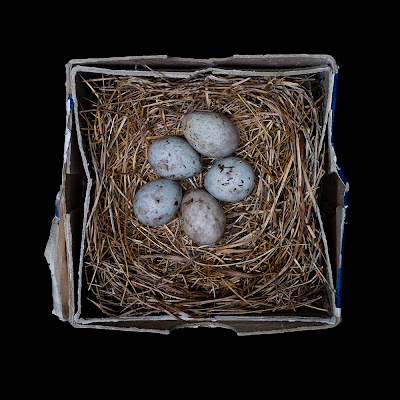 Using the warmth of a brood patch, she incubates seven pale-blue or greenish-blue spotted eggs, for ten to fourteen days. The altricial hatchlings grow fast, fledging in twelve to fifteen days, but stay with the family flock until it is time to wander. 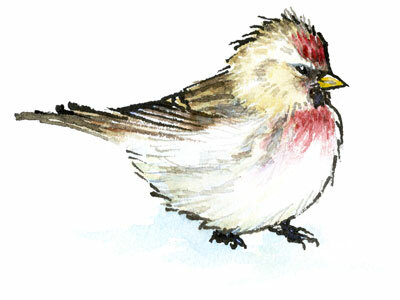 Since so little of their breeding territory is habitable by humans, Hoary Redpolls are not in danger of its loss. When they are close to civilization these endearing, snowball-shaped birds can be are quite inquisitive, and are regular visitors to bird feeders. As if I could do as well as the birds. But a couple of years ago, while sitting in the filtered shade of the oaks in Judith Larner's garden, I learned how to make a quail covey. This is a structure that anyone can build with a circle of fencing and any tall sticks and twigs that might be handy. These coveys serve as a place for the chicks and parents to duck into when taking cover from feral cats and dogs on the loose. And for the male to keep a lookout from its peak. Last fall I finally got around to building one of my own. 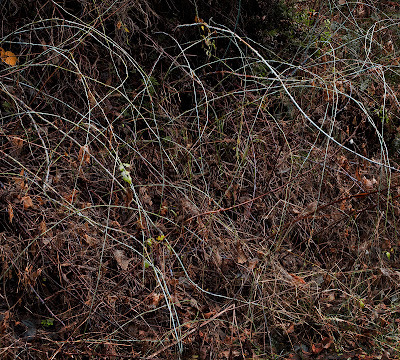 Not for my land, but for the Life as Art Foundation in Sonoma. 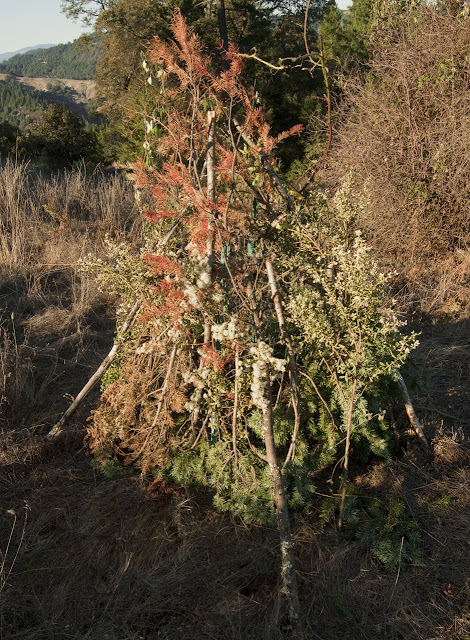 When I built this it was pouring and my boots were trudging pounds of California clay, so it is a bit haphazard, built with anything I could find on the ground as well as as much Himalayan blackberry that I could harvest. But when I returned the next weekend there were sparrows singing in it and foraging for seeds so at least it was making someone happy. I like to think that some quail have taken refuge from the resident dogs as well. Before the nests and in between, I have been drawn to the wildness at the edge of forests; to their thickets and dense understory. This was taken along the Little North Fork of the Gualala River. It could be perfect forage cover for quail, thrushes, bushtits, and other secretive birds, as well as packrats and other small mammals. The blue stem is native blackberry. I will have to go back to see what is keeping it company now in the spring. It is futile to continue naming favorites. 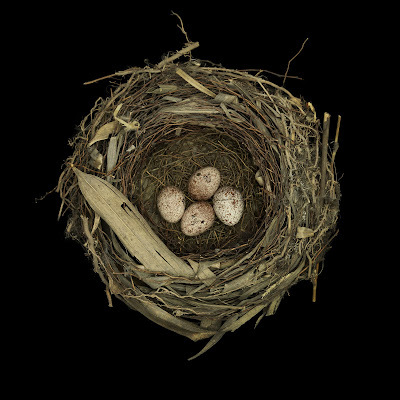 All of the nests in the book, culled from a collection of photographs that leaves at least two dozen waiting in the archives, have their appeal. Some obviously made into print for their builder's inventive use of materials or unusual fabrication techniques. But others were interesting to me because they represent a species facing some survival issues, which was one of the reasons I was compelled to make this book. The not so subtle subtext was to use the nests "as a bower bird lures a mate" to interesting even a non-birding viewer to learn what might be affecting birds today. They brazenly occupy tin cans, old hats, stove pipes, woodpecker holes, cactus, hanging nests of orioles, mud nests of phoebes, street lamps, Christmas wreaths, ivy on buildings—anything which provides solid support and overhanging cover. In the category of unique building techniques, Common Tailorbirds sometimes pilfer thread, but they put it to use in an entirely different way. 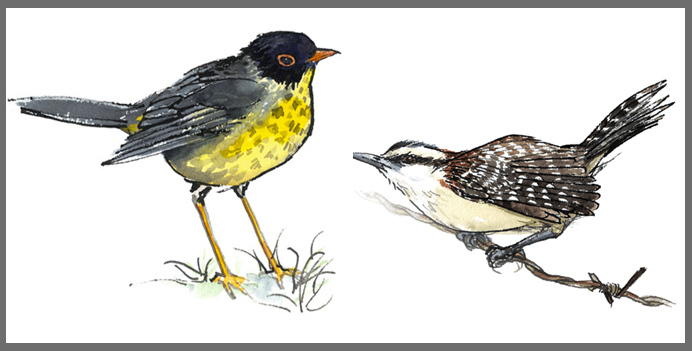 Notorious for loud, metronomic calls that range, depending on their dialect, from annoyingly harsh to melodious, these quick-moving birds are equally famous for a more endearing trait: the talent of “tailoring” live leaves of a shrub together to make a sheltering pouch for their nests. Bending a leaf, or sometimes two, or more, and piercing holes around their edges with their beaks, they insert threads of spiderweb, cocoon silk, plant, or even manmade fibers to hold them in place. They secure these "stitches", as many as two hundred per nest, by fraying the end of the fiber into a rivet-like ball. Tailorbirds living in civilization are famous for brazenly pilfering thread when their human counterparts leave their sewing projects unattended. Though the male gathers some of the nest materials, the females is the riveter, as well as the mender of monsoon made tears in their leafy shelters. And finally, at least for today, I offer this weathered fortress, chosen for the species that constructed it, the Loggerhead Shrike. These big-headed, strong-beaked birds are notorious for impaling their prey on thorns, and sometimes even barbed wire fencing. Despite eating snakes, and controlling rodent and insect infestations, shrikes also eat small birds–a penchant so reviled that a close relative, the Northern Shrike, was shot in the Boston Common to protect House Sparrows, after the introduction of this invasive species in the 1850s. But persecution isn’t the reason shrikes are missing where they used to be common. Once just found in prairies, sage deserts, scrub, and southern savannahs, their numbers grew when forests were cleared for horse-powered farms and ranches that included grassy pasture and rangeland for good hunting, and shrubs and hedgerows for nesting. But today’s vast acreages of combine-created agriculture and the incursion of sidewalked suburbs have left little untidy wild in which both Loggerhead Shrikes and their prey can thrive. They are virtually absent from the Northeast, and one subspecies in California, the island-bound San Clemente Shrike, is down to fifty pairs. Pesticide use, predation by foxes, cats and crows, along with over grazing of their habitat by farm animals gone feral have all taken their toll, and their use of roadside fence posts as hunting parapets puts them in the lethal path of traffic. It is hard to end this entry with any happy note offering what we might do to save these disappearing birds, but I am not alone in my lament at their decline. Here is an article by one of my favorite local nature writers, Joe Eaton, published in the Berkeley Planet. 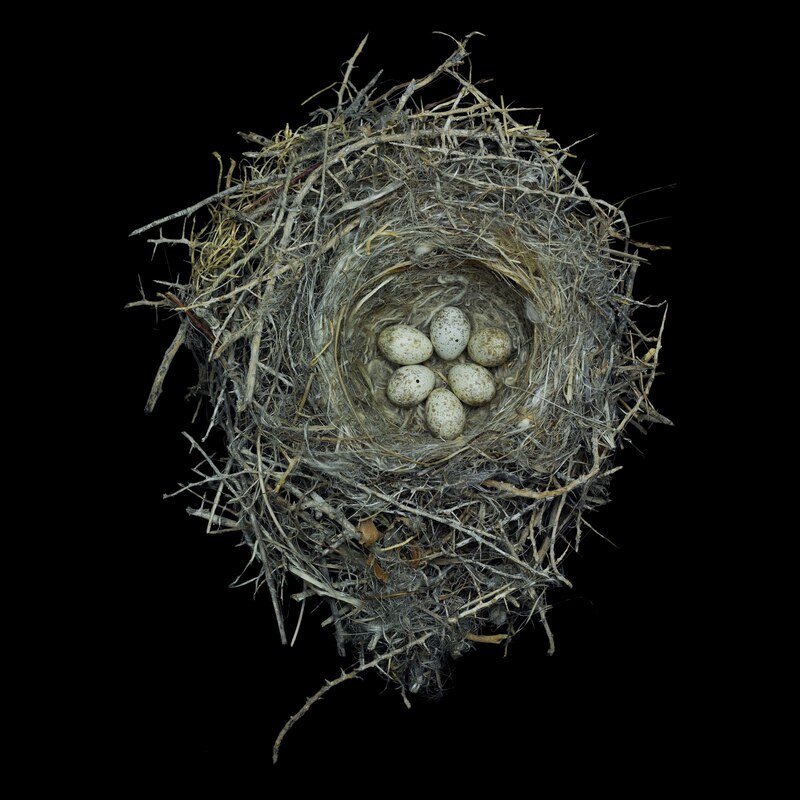 People ask if I have favorites amongst all the nests that were photographed for the book. If I do the choosing from memory, without being distracted by admiring each one again, I can call up quite a few; some for my familiarity with the birds that built them; others for their unique construction techniques or their use of materials; and for a some, their rarity and what they represent for the survival of a species. 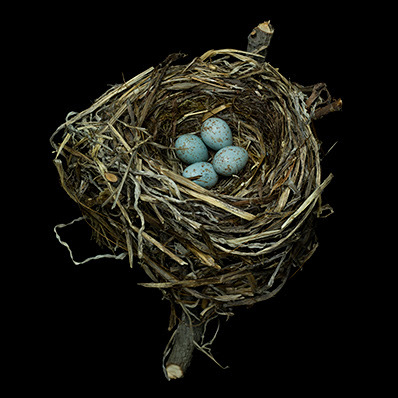 What always appears first in the eye of my mind is this sturdy woven cup built by the Swainson's Thrush, a bird that provides the evening song in the forests of Washington state where I spent half of my life, and whose eggs are a deep aqua. I also think of this nest because I remember wondering about its collector Joseph Grinnell when I saw his name of the collection data, learning later that he was one of the early and infamous contributors to The Museum of Vertibrate Zoology, as well as its first director. 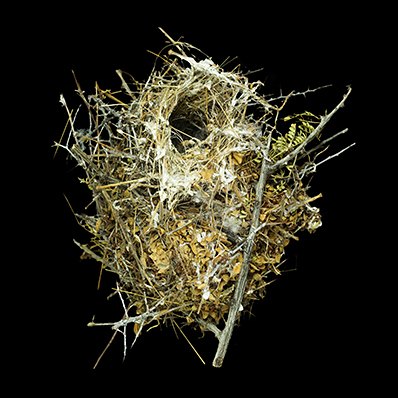 Another favorite, this fragile pile of twigs and gull feathers, was built by a pair of Bank Swallow's. Collected from Ocean Beach in San Francisco by Betsey Cutler, it was saved from certain burial by the annual winter erosion of the cliff face that a colony of Banks Swallows still calls home, if only for the breeding season. 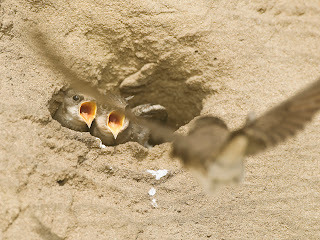 Bank Swallow chicks at Ocean Beach ready for their next insect. I have had the joy of observing that very colony. In mid-April a couple of years ago, I witnessed the males scrape the beginnings of the burrows, and later watched the arriving females join in the tunnel excavations, nest building, and brood raising. At times the sky would be teeming with these fleet aerialists, hawking insects in mad, dipping, flights. In very short time, the young chicks were waiting at the tunnel entrances for their next meal. 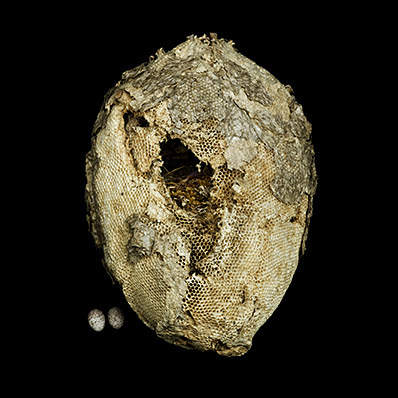 For pure curiosity, I love the image of a predated, then abandoned, wild honeycomb that became a nest cavity for a Golden-masked Tanager, and that still offered the scent of honey. Equally interesting for what looks like pure novelty, but is actually a very instinctive use of camouflage, is the mere scrape made by a Caspian Tern in a shell-covered beach, perfect cover for those lovely speckled eggs. 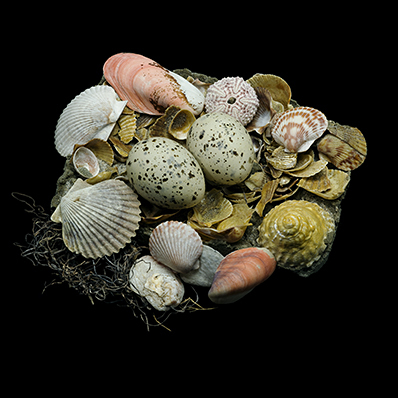 Fortunately for this photographer, what would have normally been a loose pile of seaweed and shells (that wouldn't have survived removal from a storage box), was (brilliantly) lifted and dropped into resin by the collector for preservation. I still am awed by this small, thorny, well insulated fortress, built by a pair of Verdins, small insectivores that live in arid landscapes, don't get out of bed until the insects start buzzing, and that mate while tumbling through the air. At least a few nests i honor for the conservation issues that face the species that built them. 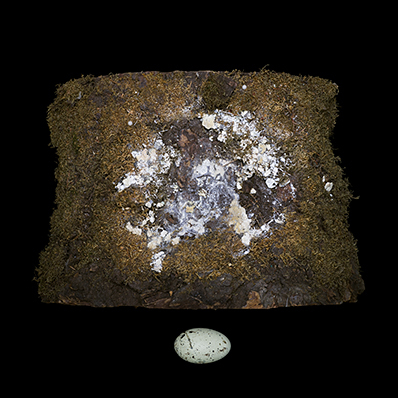 What looks like a mere depression in the moss covering a thick limb of an ancient douglas fir, and still bearing the deposits of bird excrement used to keep an egg from rolling (and a chick from falling), might be the only Marbled Murrelet nest in a museum collection. Discovered accidentally when a forester was limbing trees near a campsite, It is also the nest that led researchers to learn about their choice of old growth forests for breeding. Forest that are home to trees 200 to 2000 years old, and that bear limbs as thick as trees themselves–wide enough for a landing pad and a nesting site. 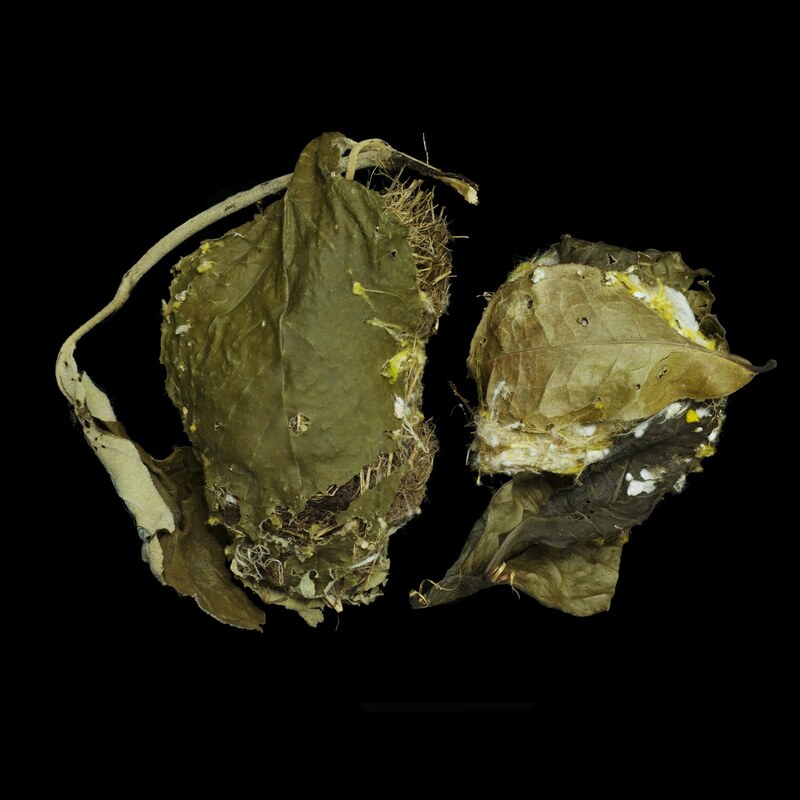 This small cup of moss and twigs, collected in a crown of a lehua tree, was built by an Akekee, a bird found now just in the highlands of Kauai above 1800 feet. This species' ability to survive in high elevations saved it from complete decimation by the waves of malarial mosquitoes and avian pox that have caused the extinction of many other Hawaiian birds, but they are still prey to so many alien animals that have been introduced by humans since the arrival of the Polynesians. As I extoll these first few nests, others are appearing in the slide show of my brain; the insulated creations of the winter survivalists, the Grey Jay and the Hoary Redpoll; the riveted leaves of the Common Tailorbird; the astonishing collection of fabric scraps of the House Finch, or the skeletons of the House Wren sarcophagus. Obviously I will be called to offer another tribute, and soon, for their are too many that delighted my eye and moved my heart to list, and I frankly am having trouble naming just a few. An eleven-foot high Kodiak bear with outstretched paws was standing guard next to me, and resting on the industrial shelving lining the walls the skulls of beasts bearing horns too wide for their own private shipping boxes gazed with hollow-eyed stares. All of this mega fauna company and I were installed in a corner of the Birds and Mammals storage area of the Howard Street location that The California Academy of Sciences occupied while the old building in Golden Gate Park was being remodeled (or as some would say, the new building was being built). 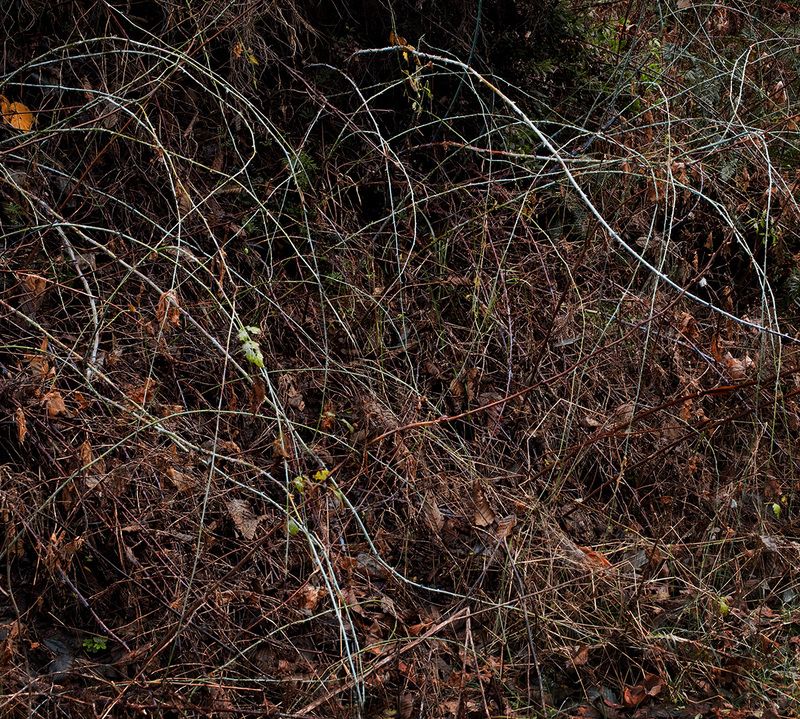 It was my first day of photographing for the book, and I was more than a little daunted. The prevailing aroma of mothballs had this scent-phobe breathing shallowly. A borrowed and very expensive (39-mega-pixel) camera was carefully cantilevered over my little photographic set, prevented from colliding (at least I prayed) with some very old historic nests and eggs by the sandbags hanging from my tripod legs. Adding to the undertow of anxiety was my own collision with the software that lets you photo tethered to a laptop–software not as intuitive as I had hoped. 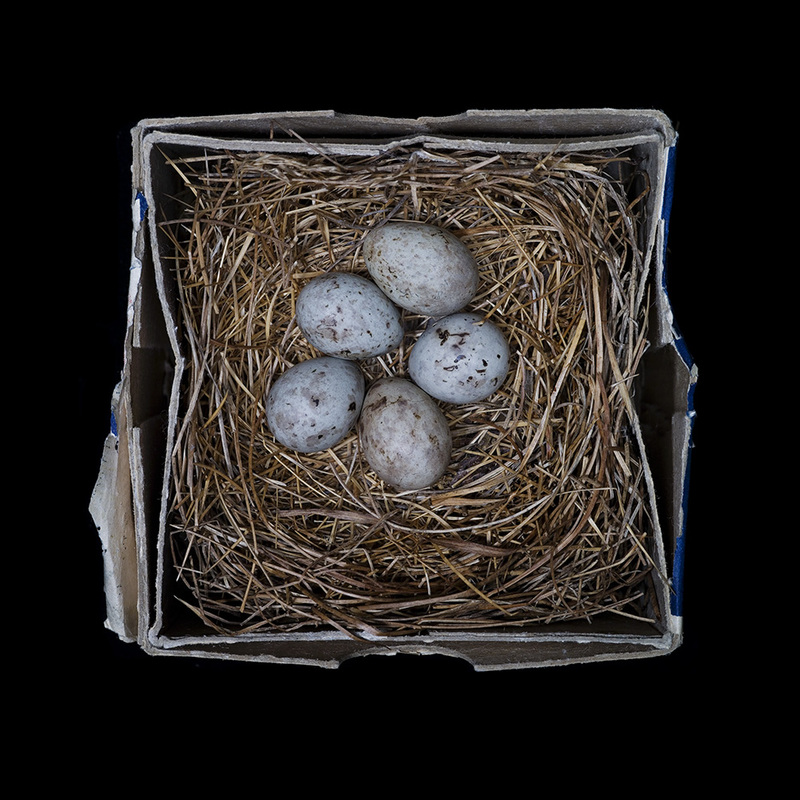 On the table to my left was a small array of the nest specimens I had chosen to photo, along with small black glass-windowed boxes containing the eggs that matched the species of birds that had built these nests. It was getting toward closing-up time, and only a few of these subjects had made it to my hard drive (pardon the geek-ette in me, another way of saying film in the can). More of them would been captured have if I hadn’t encountered an inadequacy beyond the mere technical. As embarrassing as it is to say for someone who ended up writing 50 essays about birds, I knew very little about taxonomy. All of those little egg specimen boxes were stored in cabinets separate from the nests, arranged in an order common to science museums and bird identification books, but on that day frustratingly elusive to me. Sorting it out was like trying to learn a language from tourist signs, parsing lists taped to the doors of those cabinets to decipher which was an order, family, genus or species name, aided by a only a few books also written in this new-to-me code (mercifully, they had indexes). I ended up spending hours pushing the recalcitrant portable steps back and forth from cabinet to cabinet, from the Struthioniformes (think ostrich and emu) to the Cardinalidae (cardinals, grosbeaks, and now at least one tanager) climbing up and down to sort through a hundred drawers, trying to decipher the smallest handwritten type on yellowing collection tags, only to end up finding the right species of a mere six sets of eggs. But even with the slow progress that day, the struggles with technology or taxonomy couldn’t stop me. I was driven to master both, for sitting on that table were some of the most intriguing sculptures I had ever seen, all built with beak and foot by birds whose names I first learned in Latin, but whose stories I would end up learning by heart. In a few weeks, the search for for Larus, Spazella,Tangara, or Petronia turned into a treasure hunt usually ending in minutes rather than hours. 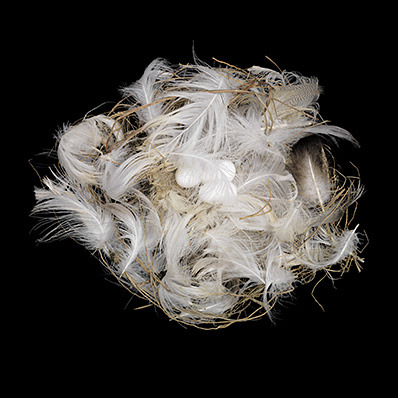 The software became a useful tool for photographing specimens in layers of focus, later merged to render all of the nest materials in fine detail. The mothballs (a stopgap measure in the temporary location to keep precious specimens from being chewed on by insects) became a familiar if not nostalgic scent that will always carry with it an accumulation of memories of the most wonderful time of my life. Welcome to On This Earth, a project that has been incubating in my brain for few years, and just now taking its virtual form. At the least It will be a place where I can post images and ideas that only exist in the hard drives that store them, and at it’s best it will be a link to a larger community of thinkers and image makers using their creativity to exclaim, extol and inspire. 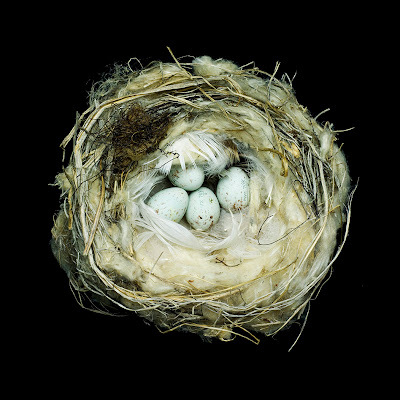 This first post was prompted by finally seeing my own version of exclaiming and extolling in beautiful four-color print: Nests: Fifty Nests and the Birds that Built Them (Chronicle Books), my photographs of bird’s nests and eggs from the collections of The California Academy of Sciences, The Museum of Vertebrate Zoology, and The Western Foundation of Vertebrate Zoology with accounts of the nesting habits of these avian architects. Thanks to its welcome into the world, this labor of love is being released a month before schedule. This response to the book I have to first attribute to its looks: the spot varnished front cover (sans title), the highly detailed reproductions, the design elements, and Laurie Wigham’s accurate yet charming bird illustrations. Add to this the wonderful prose of Scott Weidensaul’s introduction, a personal account of nests seen in a life spent in the natural world, Jack Dumbacher and Maureen Flannery’s essay about the history of nest collecting and its importance for research, and the poem by Mimi White that describes the wonder that a bird sighting can inspire­—all are worth reading more than a few times. Finally, I think I can say with some pride that the essays are an informative read. As a photographer with only a few journalistic credits, I will spare you the angst that I endured with this wild leap into writing (not to mention about science). But after a read of the book by Linnea Hall at The Western Foundation of Vertebrate Zoology, I am reassured that I digested and parsed the data from nearly 150 species accounts and research papers accurately enough, and it should engage even the most avid birders. 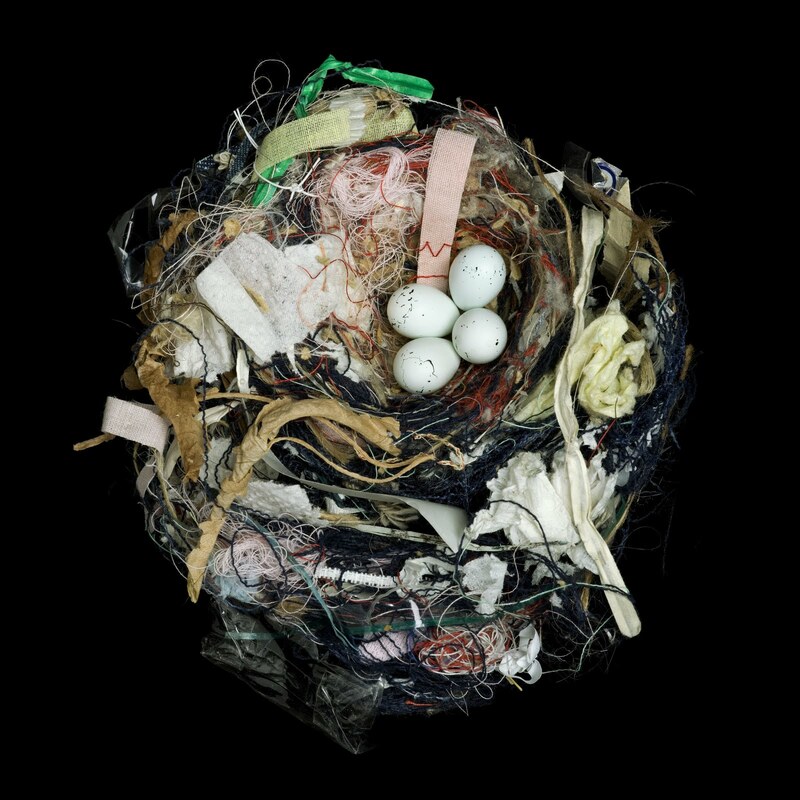 Take your photograph of an urban nest and submit it to the Cornell Lab of Ornithology’s Funky Nest photo contest.